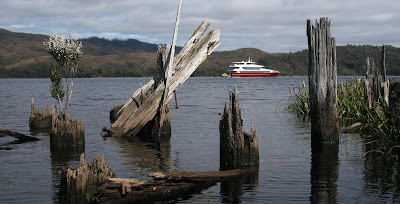 Unlike what seems these days to be the rest of the population of the western world, I've only been on two cruises - oh, hang on, three: I was forgetting the fancy catamaran up the Gordon River in Tasmania for a couple of nights. But that's in another class entirely from what most people think of as a cruise these days - and so was my first time really, on a small ship through a few of the Fiji Islands, which was pleasant and comfortable, but, you know, small. Cruise ships are getting bigger and bigger: 'floating cities' may be a cliche of ad-speak, but it's also totally accurate. 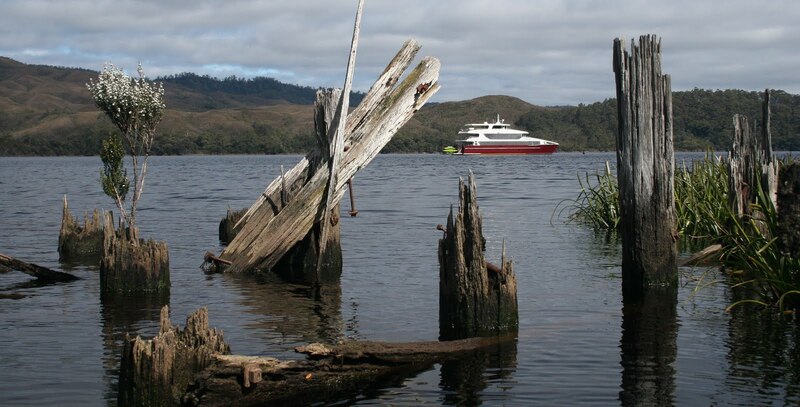 And they're already past the point where the destinations are the main focus - really, they could just be moored in some immense swimming pool and most of the passengers would be so caught up in the eating and shopping and entertainment on board that they wouldn't even notice. The latest Disney cruise ship has virtual portholes in the inner suites that are more in demand than those with real views over the real sea, because these ones come with interactive Nemos. 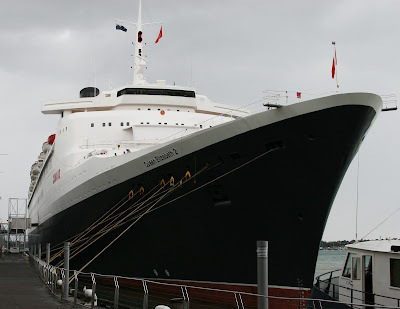 I've been on board the Cunard liners - not, alas for a cruise, but for a tour and a fancy lunch, and they are very classy, if slightly absurd (waiters with white gloves - how impractical!) Even the new ones, like the Queen Mary, are designed to have an aura of mid-20th century elegance and exclusivity that hopefully discourages inelegant behaviour amongst the guests. (Probably most of them are too old to do more than clash Zimmer frames anyway.) The ships are certainly beautiful to look at, inside and especially out, with those classically raked bows - nothing like the glaring white bricks of the modern jobs. The only proper cruise I've been on was on Silversea's Silver Whisper, a small ship (maximum 380 passengers, and it was only 2/3 full) and even though I'm still not a convert to cruising per se (too much about the journey, not enough destination, so not very productive for stories - also, very fattening), this was a great experience. Again, there were absurdities - ranks of waiters hovering to seize our filled plates from us at the breakfast buffet to carry for us to our tables, the whole dining room seething with these mini-parades - but besides being very luxurious, it was friendly too. And the bed! Twelve centimetres of pillow-top plus gentle rocking from the ship = best sleeps ever. Perhaps though what made it seem so very welcoming and comfortable was that the cruise was along the coast of China, and the ports we called at delivered such an overwhelming dose of foreignness that it was a huge relief to return each time to familiar surroundings and cheerful staff who knew our names. UPDATE: At the risk of discrediting this whole post, I've just remembered the fabulous cruise I went on through the Galapagos Islands - but again, it was a small ship, and it was all about the destination, rather than the on-board facilities (which were great).